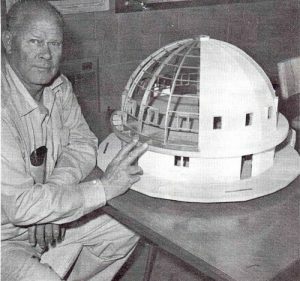 Can you just drop by the Integratron and see it anytime? Sorry, no. The Integratron is open by appointment only, and we are always closed on Tuesdays. Our schedule changes week by week. If you drop in you will more than likely find a closed gate. It is best to call 760.364.3126 or email integratron@gmail.com and ask if there is an opening for your visit. Does the Sound Bath involve getting in water? No it doesn’t. The Sound Bath is conducted while you lie upon a mat in the sound chamber. You are “bathed” only in sound. Please read about the Sound Bath experience here. Pets are not allowed at the Integratron. Please do not bring your pet. California law enables people to bring their trained and certified service or psychiatric service animals. All other animals are prohibited, including emotional support animals. It is not safe to leave your pet in your vehicle during the Sound Bath, due to the temperatures in our area most of the year. Certified service animals ONLY may be left on a leash in a shady area of our courtyard during the Sound Bath (please bring your own water bowl) – no animals are allowed inside the Integratron at any time. If your animal barks or makes noise when left alone, you will be asked to stay out of the Sound Bath. The Integratron reserves the right to ask you to leave with the animal if they are a nuisance to other guests. What is the difference between the Private Sound Bath and the Public Sound Bath? All Sound Baths are a one hour session conducted in the sound chamber of the Integratron. This is a private experience for you and your guests by reservation only. Weekday appointments book a few weeks to a month in advance. Weekends book up a few months in advance. Once the Private Sound Baths have all booked in a given day, we begin taking reservations for the Public Sound Bath. This is a combined group experience limited to 30 people by reservation only. $35 per person during the week, and $40 per person on the weekends. Rarely available last minute, they usually book up a week or two in advance. You can browse our availability and schedule, and make a reservation directly through our website here. Click on the “Book My Public Sound Bath.” tab. How do I make an appointment for a private Sound Bath? The best way is to send an email to integratron@gmail.com to request an appointment. Please provide your contact phone number in your email, your requested date range, and the number in your party. You can also call the office at 760.364.3126. What do I need to bring/wear? Does the Integratron provide mats/blankets? You only need to bring yourself, and we encourage you to wear loose, comfortable clothing (layering is always a smart option). We do ask that you remove your shoes downstairs, so please feel free to bring a pair of socks with you to wear upstairs. We provide mats, pillows, and blankets, however you are welcome to bring your own to lay on top of our mats if you desire. Is the Integratron heated and cooled? Yes! In the summer months, the Integratron is cooled by an evaporative cooler and air conditioning. It’s usually about 73-80 degrees inside the building (it is warmer in the afternoon). June – September it can reach or exceed 100 degrees every day outside; this is where you’ll be relaxing for about 30 minutes before your session starts (please check the weather in our area before your visit). We have lots of shade and misters for your comfort. We also recommend that every guest bring a water bottle to fill up with our great well water; hydration is key! In the winter months, the Integratron is heated, although it can drop into the low 60s sometimes if it’s very cold outside. Please bring several layers, and we provide blankets as well for your comfort. What if my GPS routes me on to a dirt road on the way to the Integratron? Don’t do it! The Integratron is located on a paved road – and the most direct route is all on paved roads. If your GPS routes you on to a dirt road, please stay on the pavement and let your satellite navigation recalculate the route on pavement. Before you visit, please print the directions from our website. What else is there to do at the Integratron besides Sound Baths? The Sound Bath is the main activity to enjoy at the Integratron. We are not open for tours. We do have a lovely outdoor courtyard however, with lots of shady hammocks and couches for you to relax in. You’re welcome to come visit and get more information even without a reservation. Please call ahead to make sure we’re open! Can we rent the Integratron for a private event? Yes, we offer the Integratron for private rentals by the hour, and also by the day. We do not allow overnight rentals. Please see our Rentals page for rates and information. Is the Integratron available as a film location, or can I record my experience in the Sound Bath? No sorry, there is no recording of the Sound Bath allowed. The Integratron Sound Bath is protected by a copyright. The Integratron is also not available as a film location. Yes! The Integratron parking lot is not paved, however we have a designated parking spot for those with handicapped placards, as well as an ADA accessible restroom. The only way up to the top floor of this historical building is by climbing a short set of steep stairs. We normally ask guests to remove their shoes downstairs, however if you need to keep yours on for mobility that’s always fine. We will happily drive you to the Integratron if the walk is too far from the courtyard, and if it’s too difficult to climb up the stairs, you can enjoy the Sound Bath on one of our comfortable chairs or couch on the bottom floor. We’ll do everything we can to make the experience easier for you. Please contact us via email or phone before your visit if you have concerns or feel you may need extra assistance. I’m pregnant, is it safe for me to have a Sound Bath? Yes! Many pregnant women have had sound baths and we have not had any reported problems. The sound is very relaxing, and not loud enough to be damaging in any way. We have lots of pillows and blankets that will help make you comfortable, but feel free to bring what you need as well. If you have any reservations, we recommend you trust your guidance and ask your doctor. Can I bring my children to the Sound Bath? Children over the age of 5 are permitted only in the Private Sound Bath appointments. For the Public Sound Baths, children must be 14 years of age or older in order to participate. We have no on-site childcare available. Can we bring a picnic lunch with us? Yes! There are tables and chairs in the shade for you to enjoy a snack before or after the Sound Bath. Are food and beverages available for purchase at the Integratron? Our gift shop offers a selection of bottled cold beverages, including coffee, tea, and sparkling water. For snacks and meals, your best bet is to visit the towns of Joshua Tree or Yucca Valley, each 20 minutes south of the Integratron, La Copine, or visit Pappy & Harriet’s in Pioneertown. Can we camp at the Integratron? Camping is not available at the Integratron. Joshua Tree National Park, Joshua Tree Lake Campground and BLM open space lands are within 20 miles of our location. Where do you recommend that we stay nearby? Please see our list of local lodging recommendations here. Do you use fragrances inside the Integratron? Yes, inside the Integratron we use pure Rosemary essential oil, and we burn Palo Santo (a wooden natural incense).